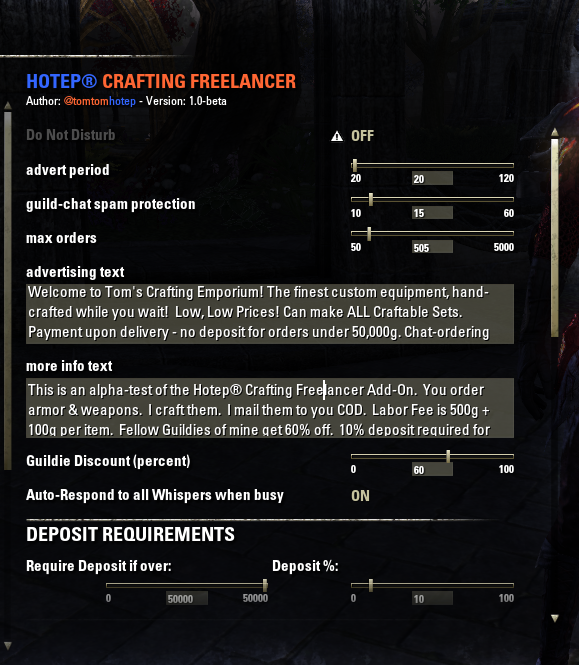 This addon lets you become a Custom Equipment Crafter for Hire! Periodically advertises your services on Zone Chat. Takes orders from customers using an automated chat interface. Automatically mails them a receipt when they complete their order. Lets potential customers request pricing lists, and automatically mails the lists to them. 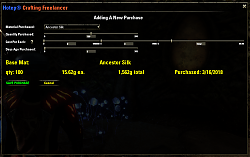 Allows customers to provide their own crafting mats for a discount (if you configure that option). If they answer yes, the addon mails them the list of mats needed for the order, including the per-unit discounts for each mat. Allows you to require deposits from customers if their order total is above a threshold you set (if you set one). Automatically detects when you receive the deposit. Lists your Waiting, Started, and Delivered Orders on the main window. Displays the order you're working on, and the materials needed to complete it. Helps you get needed materials from your Mule Toons (if you have any). At any crafting station, it shows you the items you still need to craft at that station. Chat message tells you when you've completed your order. Automatically mails the ordered items (COD) to the customer with a few clicks. 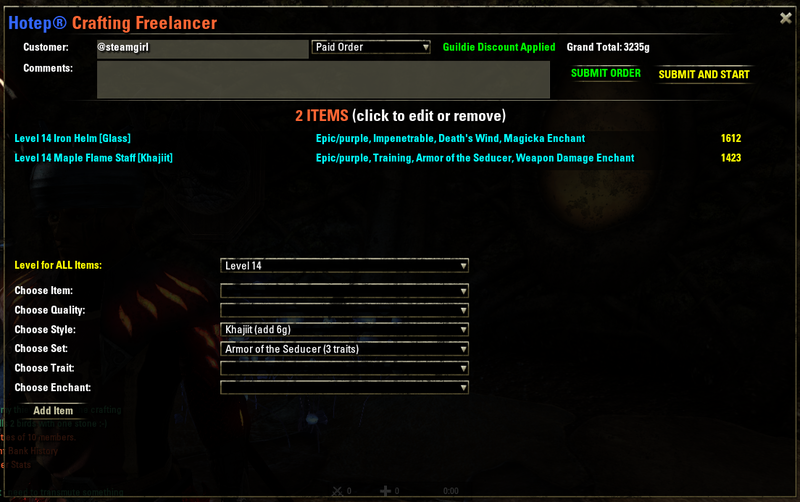 Integrated with FCOItemsaver (to auto-mark items crafted for your order). 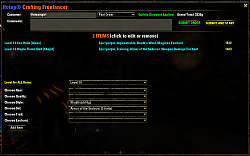 Addon Settings Panel has a full list of optional Slash Commands. 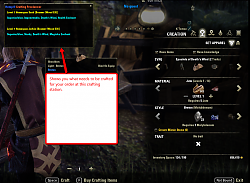 your crafting mat purchases in the "Add New Purchase" window. 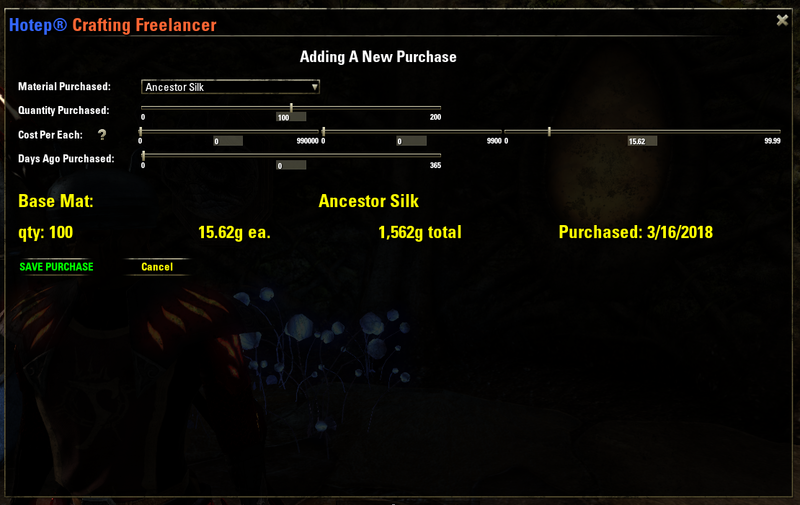 Use the addon settings panel to set all of your selling prices and fees. All prices and fees are set on a per-unit-of-material basis. 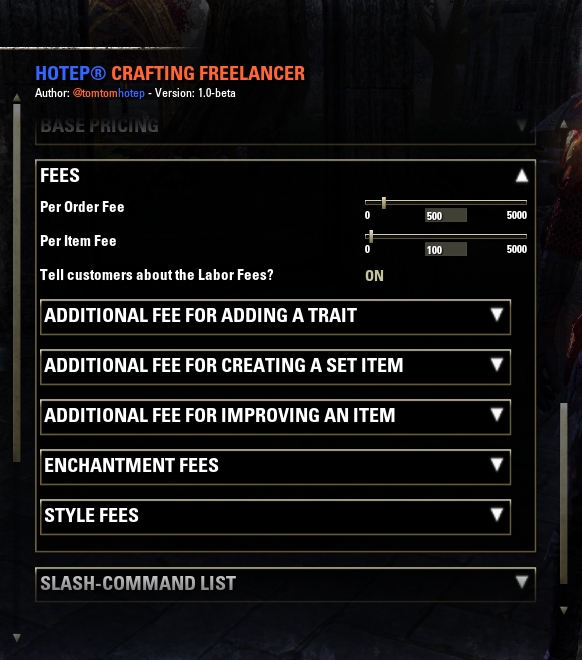 You can also set Per-Order and Per-Item Labor Fees. 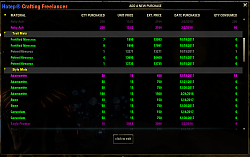 The addon does the all the math to calculate the final prices of items, and the Order Total. 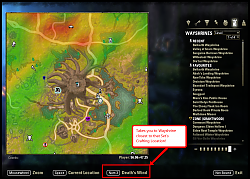 mouse wheel will CHANGE THE VALUES of the sliders! the far right of the panel, far away from where the sliders are!!!!! Level 6 Iron Axe, Fine/Green, Training, High Elf Style, non-set item, no enchantment. That requires 5 Iron Ingots, 1 Adamantite, 1 Carnelian, and 2 Honing Stones. and your Per-Item Labor Fee to 100g. So the Item Total would be 190g, and the Order's Grand Total would be 690g. 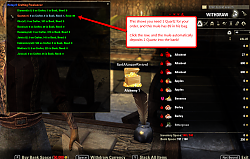 Get rid of the duplicate Essence Runes in the Enchanting Fees Setup. Make selecting a mat easier in the "Add New Purchase" window. Ability to customize the default mail body for the delivery mails. 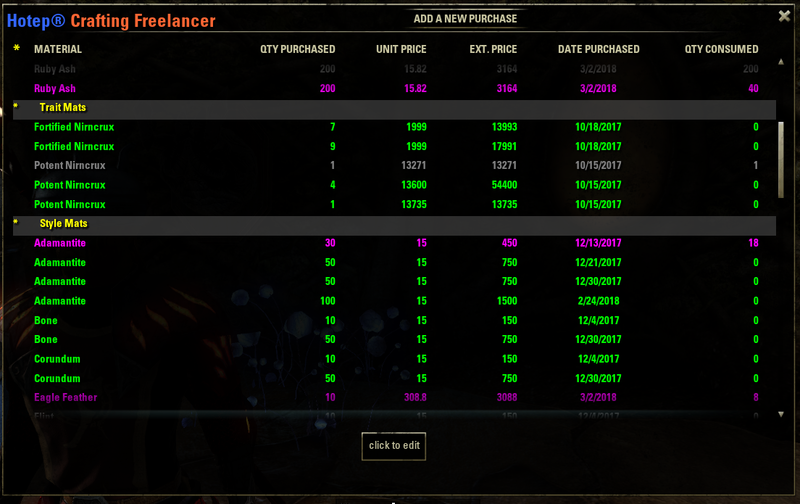 Add "Reset Stats" button to reset the Sales/Profits Statistics. Make "mule window" work for withdrawing from Housing Storage. Support in-person trading window for order delivery & payment. Recognizing glyphs for the enchantments needed for the items. Automatically detect crafting material purchases. Add preview windows for viewing what your price-list, set-list, and style-list mails look like. Support orders for Potions and Poisons. Support orders for Foods and Drinks. Support swapping orders with other players who use this addon, maybe??? 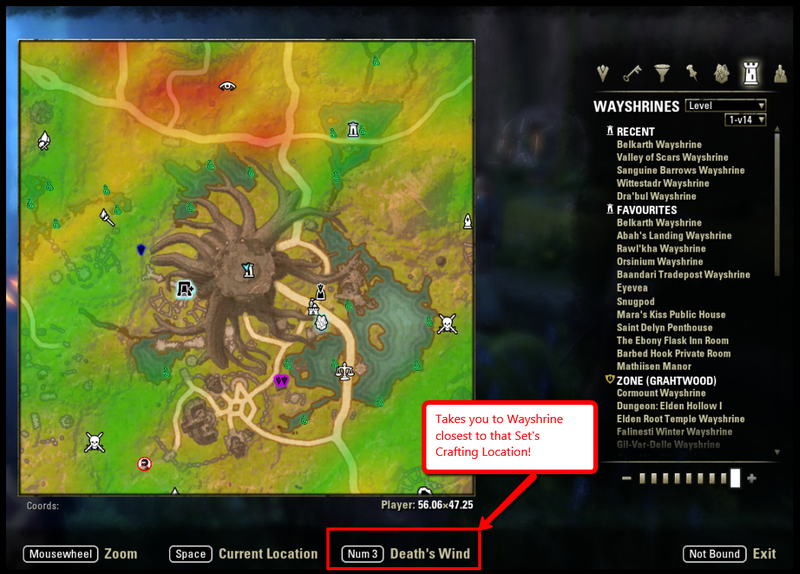 1.10 - added new sets and styles from Murkmire update. 1.9 - Now shows what mats have been provided by customer so far, on order-detail window. - fixed: manual-entry window was allowing user to immediately start work on an order that requires a deposit. - added support for allowing customer to provide mats in manual order-entry window. 1.5 - the material-list mail that gets sent to the customer will now contain item links for the materials. - now shows mats-on-hand on order-detail window using integration with Inventory Insight -- shows in tooltips - hover over the list of materials. 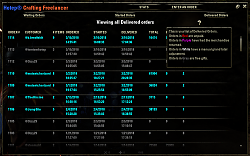 1.4 - fixed addon's ability to handle an order with 2 or more items that are identical except for quality and/or enchantment. - fixed problem with mule window. 1.2 - fixed: Addon can now handle 2 (or more) absolutely identical items in the same order! 1.1 - fixed: addon again recognizes when you craft / improve an item for your order. 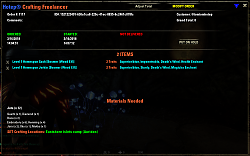 Is it possible to import data from something like Master Merchant for the material charges? That's exactly the next thing on my list to add! I've just been so busy lately with all those Events, plus some IRL stuff, and working on another addon that I desperately need and can't find anything suitable already written. Awesome! I'm definitely keen to see that! With all the fields in the correct order and no misspellings. 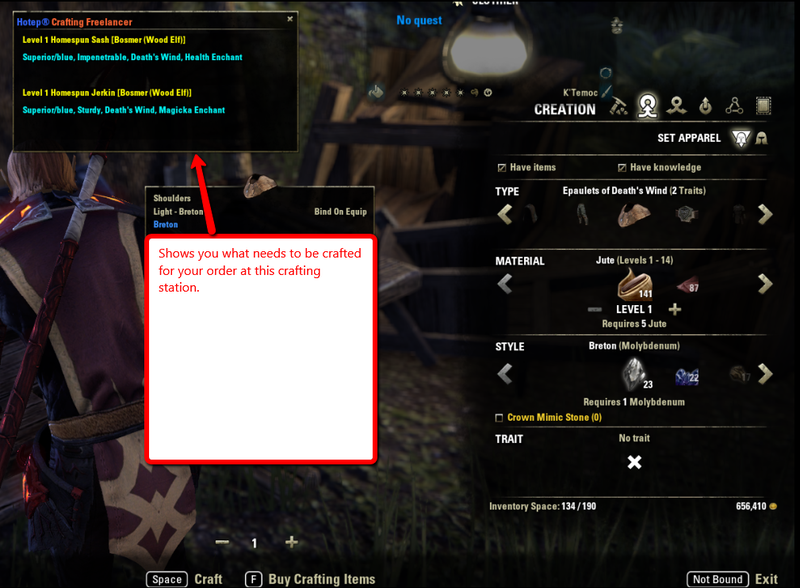 However, since the beginning, I've been planning to write a companion addon that frequent customers can use to create an order (using the same interface as the "Enter New Order" feature) and send it in exactly this way to a crafter using this addon. 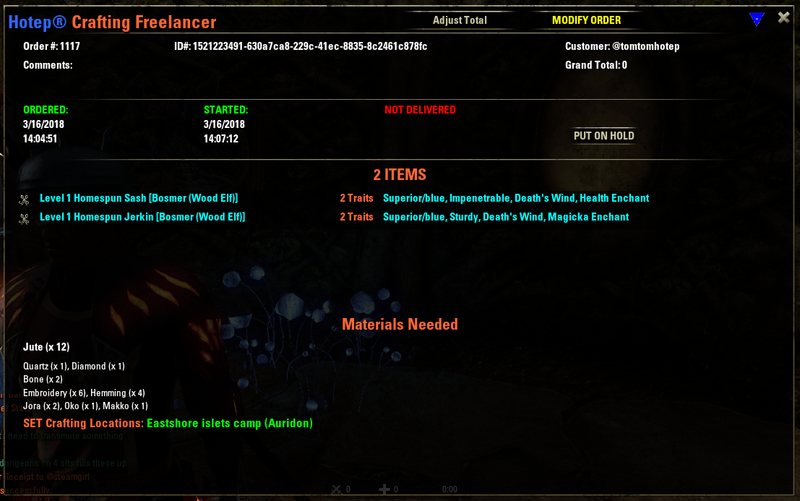 My intention is to see how popular this addon becomes before writing the ordering companion. Thanks for the bug reports. I'll take care of them as soon as I can. I don't think so. 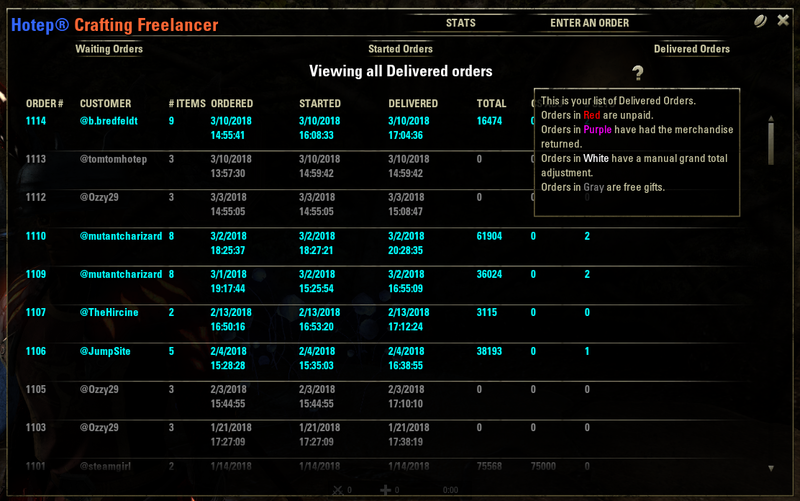 From the screenshot, it looks like the addon was waiting for a customer to send mats for an order, and the addon got confused by a Hireling mail. ... or is Nelysia a customer that was sending you mats? Just had a few issues today taking orders. Firstly, customer tried to edit an item in the cart which triggered a ui Error. he was trying to change the Style type for an item. 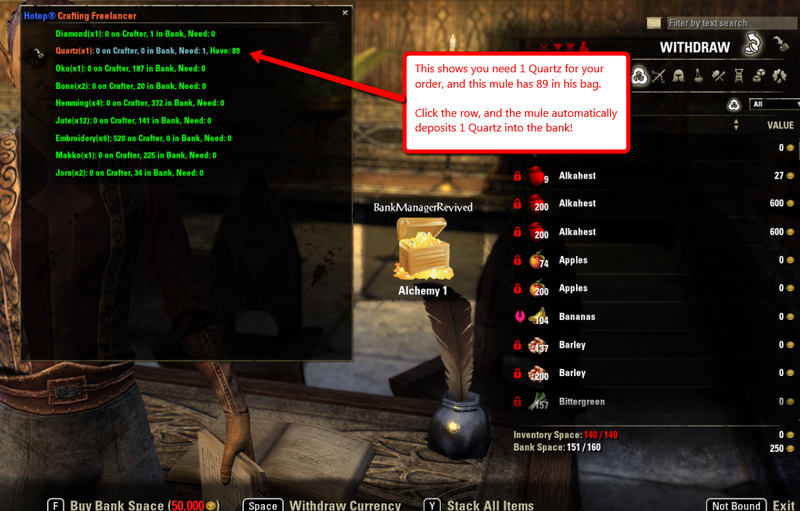 Hi there, I really like the concept of this addon, but currently do not use if myself for one particular reason. Would it be possible to add an option to disable the auto chat message entirely? I love the interface and feature-set of the order tracking and pricing, but would prefer take the orders manually via the chat commands and user interface. In this case I do not need the auto advertisement part of the addon. Actually, I've been wanting to add that myself for awhile now! Would it be possible to add an option to disable the auto chat message entirely? I love the interface and featureset of the order tracking and pricing, but would prefer take the orders manually via the chat commands and user interface. In this case I do not need the auto advertisement part of the addon. = 0 / 0 ... D'Oh! I should be able to find and fix that today. Last edited by tomtomhotep : 05/05/18 at 09:41 AM. Well that didn't take long, just had (mostly) the same error pop up upon logging in to an order-taker. Different line this time though, 299 as opposed to 221. My SV file is now 27kb as opposed to the previous 26kb. 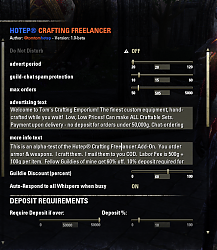 I did not get the "[HotepCraftingFreelancer] Loaded in order-taker mode." message upon logging in, despite getting those same similar messages from other addons. If you get a similar error message, open the saved variables file without logging out or reloading ui and copy paste the whole saved variables file. That will get what it looks like before the game wipes it. Unfortunately I don't have that specific SV file any more since deleting/uninstalling/reinstalling has been one of the steps I've been trying to remedy this. I didn't notice if it loaded in order-taker mode or not. I do believe it's always been Line 221, but I'm just trying to recall from memory. Now that I'm here/registered and posting about it, I'll take much better note of any errors that pop up. By no means am I an addon maker, but I'd make a guess that it's not from a ton of variables being saved. The only reason I say this is because the .lua in question is 26kb, with many other addons' saved variables files being significantly larger (Azurah @ 51kb, AlphaGear @ 315kb, Master Recipe List @ 924kb). Had the error pop up again today immediately upon logging in to a character that at one point was listed as an "order taker" within the addon. Though I don't know if the addon still thought that at the time of this error. Can you send me your saved variables file? 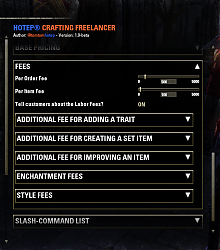 Also, when you got that error immediately upon logging in to a character, did you notice if "[HotepCraftingFreelancer] Loaded in order-taker mode." appeared in the chat? Also, does the error always have the same line number (221), or is the line # always different?